Lots of unpleasant things can happen to your teeth. They can become chipped, cracked, broken, and even decayed. Fortunately, if this ever happens to you, Dr. Thomas Novak, Dr. Johannsen, and our team will be able to fix you up faster and better than anyone else in Weatherford. We’ll provide you the kind of restorations that will make your damaged teeth strong, durable, and look beautifully natural. To learn more about all the ways we can rebuild your smile, simply read on below. A dental crown is one of the most useful treatments in all of dentistry. It is a simple tooth-shaped restoration that fits over the top of a damaged tooth, and it can be used to repair everything from a small chip to a large cavity. Crowns can even be used to improve the appearance of misshapen or oddly spaced teeth. In fact, crowns can also help replace one or more missing teeth in a row. 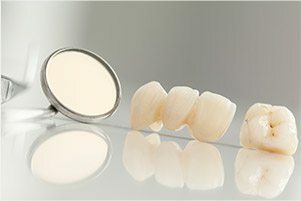 After placing crowns on either side of the gap in your smile, Dr. Novak or Dr. Johannsen can then bond them to prosthetic teeth that literally “bridge” the gap. It’s one of the easiest ways we can repair your smile and save you from a wide variety of bite alignment problems. Gone are the days of gold teeth and black lines around old crowns. Modern materials like Zirconium and Emax render today's crowns virtually indistinguishable from natural teeth. You can see examples here, or ask us when to show you the difference when you visit. If you have a small cavity or slightly damaged tooth, we’ll most likely repair it with a filling. 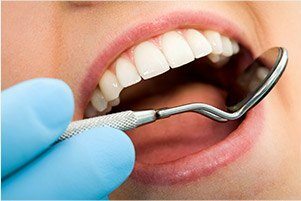 In the past, fillings were made of a metal material called amalgam, and while traditional fillings can be very useful, they also have a number of drawbacks. They always leave a large gray mark on the tooth, instantly altering the appearance of a person’s smile. Plus, in order to place a metal filling, a dentist needs to create a pocket in the tooth for it to sit in, which often means removing healthy tooth enamel. This, in turn, can make a tooth much weaker and more likely to crack in the future. This is why our practice chooses to use tooth-colored fillings. As far as appearance goes, they can be specially shaded to perfectly match the color of the teeth, making them practically invisible. Also, they are made of a composite resin that is actually able to bond directly to the enamel. This means when the filling is placed, Dr. Novak can preserve more of your tooth’s natural strength, assuring that your new tooth won’t just look great, but that it’ll last as well. If you are missing multiple teeth, one of the easiest and most effective ways to replace them is with a denture. 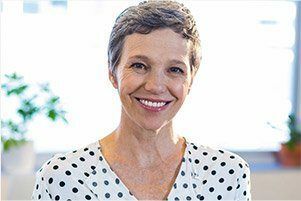 Modern-day dentures are much smaller and sleeker than ones from the past, meaning they’ll be much more comfortable and natural-looking than anything your grandparents might have had. With a partial denture, we can seamlessly replace missing teeth located throughout the mouth. For an entire row of missing teeth, however, we can give you something called a full denture that will restore all of it. No matter what you need, we’ll make sure you get a denture that has the perfect look and fit just for you. Quite frankly, the best dentures go completely unnoticed. Before you scroll past this, just know that a root canal is NOT an excruciatingly painful procedure. They’re used to repair teeth that have suffered damage deep inside them where the sensitive nerve resides, and they’re actually one of the best tools we have to RELIEVE severe dental pain and save teeth that would otherwise need to be extracted. 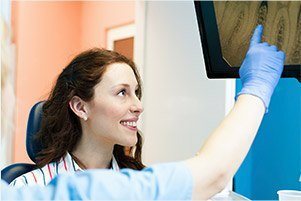 Thanks to modern dental techniques including anesthetic and sedation, most patients say a root canal is actually no more difficult than getting a filling. No matter the reason for your extraction, Dr. Novak will use a gentle touch and a generous amount of local anesthetic to make sure you are comfortable during the entire procedure. For most people, the wisdom teeth (or third molars) need to be removed because the modern human jaw is simply too small to accommodate them. If left alone, these teeth can become stuck (impacted) while trying to erupt, and this can cause the other teeth to shift, jaw pain, and even an infection. 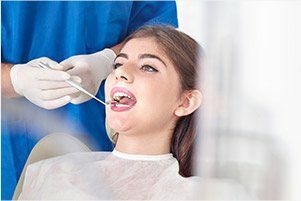 We can perform both a simple extraction (after they have erupted) and surgical extraction (before they have erupted) at our practice, and we’ll make sure to remove these teeth before they can cause you any problems. Our restorative services can give your teeth back everything they’ve lost and even prevent small problems from becoming large ones. In any case, you’ll only get the highest-quality of care, and your end results will always blend in seamlessly with the rest of your smile. If your teeth need a little help, don’t wait, please contact us today for an appointment.